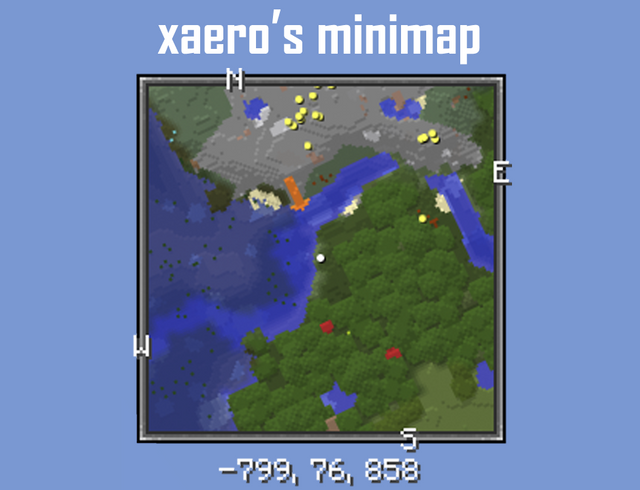 Unlike many other minimap mods, Xaero's minimap keeps the aesthetic feel and look of vanilla Minecraft which might even make you forget that it was a mod in the first place. It's also the first rotating square minimap for Minecraft but there is a toggle to make it lock north and not rotate. See the full list of mod features below. This mod is Copyright ©xaero96 and is the intellectual property of the author. It may be not be reproduced under any circumstances except for personal, private use as long as it remains in its unaltered, unedited form. It may not be placed on any web site or otherwise distributed publicly without advance written permission. Use of this mod on any other website or as a part of any public display without permission is strictly prohibited, and a violation of copyright. However, using this mod in your publicly available videos is ALLOWED as long as you provide a link to an official mod page and using it in your publicly available modpacks is ALLOWED as long as you provide a link to an official mod page and you do not profit from the modpacks. Start the version of Minecraft that you're going to install the mod for at least once. Download and run the recommended installer for the needed Minecraft version (1.10.2, 1.9.4 etc). This should create a new "forge" profile in your Minecraft client if this is your first time using Forge (to change which Forge version to run you'll have to edit the "forge" profile). Start Minecraft with the "forge" profile at least once. Choose the latest version of the mod for your Minecraft version and click "Download (.jar)". Wait 5 seconds and click "skip ad" in the top-right corner of the page. Find your way into the "mods" folder as described in the previous step. Put the mod jar you've just downloaded in the "mods" folder. You can now install any mods compatible with your Forge version by putting them in this folder. Start your minecraft launcher and start the game using the "forge" profile. If you are still having problems getting the mod to work, contact me. Contact info is available in the sidebar. Own a server and don't want your players to use some of the features? Install this plugin on your bukkit server: Click here to download! Credit to Zelnehlun for helping me with the plugin. Great review! Big thanks for making it. Added to the main post. The best minimap mod I have ever used, well done bro. Wow, this is an AWESOME mod! But sometimes when i teleport, the map forget to loading and i have to reload the whole map. Btw, thanks for your work! It's most likely a Minecraft bug since the mod uses the /tp command. Gotta wait for Mojang to fix it, unfortunately. Fantastic mod, and I love the fact that its practically 1/15th the file size of Journey, but Ive noticed while traveling in my world that it treats Mycelium as a green block which is odd. Not ssure if its an oversight? Also, are there any plans to add a world map to show parts already explored? It shows Mycelium as green because that's what it looks like on vanilla maps, which is what this mod is supposed to fit. Right now, no plans to add a world map since vanilla MC already has it's maps. Don't want to devalue them. However, it's definately possible that I will change my mind in the future. Fair enough. I only ask because on servers it makes it easier to locate other players' homes or even makes it easier to meet up with players ala "you see that brown dungeon in the upper right corner, meet me there," kind of thing and that is something that is kind of hard to replicate with vanilla maps. 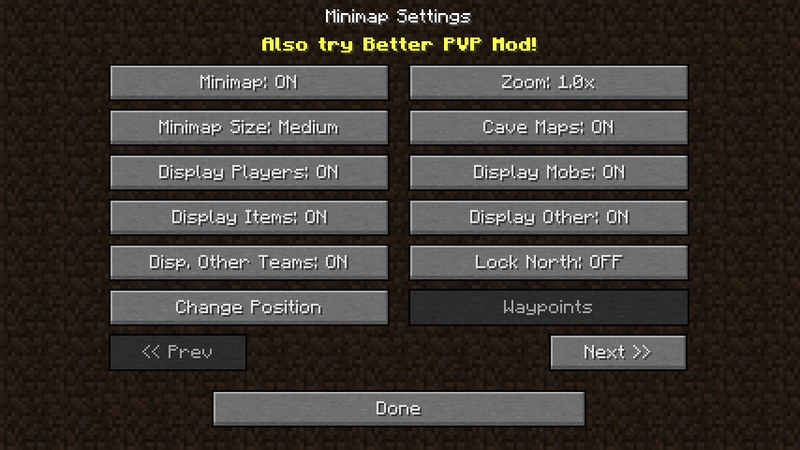 That's awesome, minimap for 1.8 is just what I needed! + Added deathpoints. A special waypoint will now be created every time you die. * Removed shadows from on-map waypoint initials. * Fixed waypoints not loading on LAN servers. Please note that waypoints created before this update will still not load (ONLY APPLIES TO LAN). Ahah, don't worry, only 1 new feature got added. Does the 1.3.7.3 version not come with death points? Is death points only in versions for mc 1.8+? I download 1.3.7.3 and died and no way point was made. That is correct. It was a bug fixing update for 1.7.10. New features will now only come to 1.8+ versions. + Added an option to view chunk grid on the minimap. Can be toggled in the minimap settings. + Added a dropdown menu instead of a button for choosing a colour when creating a waypoint. + Added shadows to on-map waypoint initials. * Increased minimap chunk load radius by 1 and sped up chunk loading to balance out the increased radius. Previously, you could see empty chunks in the corners of the minimap even with the highest render distance. Chunk loading speed and distance will become configurable in the future. * Changed default waypoints colour from black to random. * Fixed waypoints not saving on LAN servers. + Customizable minimap entity dot colours. + Added Italian language support. Big thanks to Sporadicamente for translating! * Minimap chunk loading improvement + optimization. Will now only constantly update chunks that are visible on the minimap. * Improved dropdown menus. Selected option will now always be first in the menu. * Minimap motion blur will now automatically turn off when your FPS drops under 35. Will now look a lot better on low-end PCs (should've done this a long time ago, oops :P). * Fixed minimap zoom not saving correctly when zooming out. * Other bug fixes and tweaks. This is the best mapmod ive ever seen! 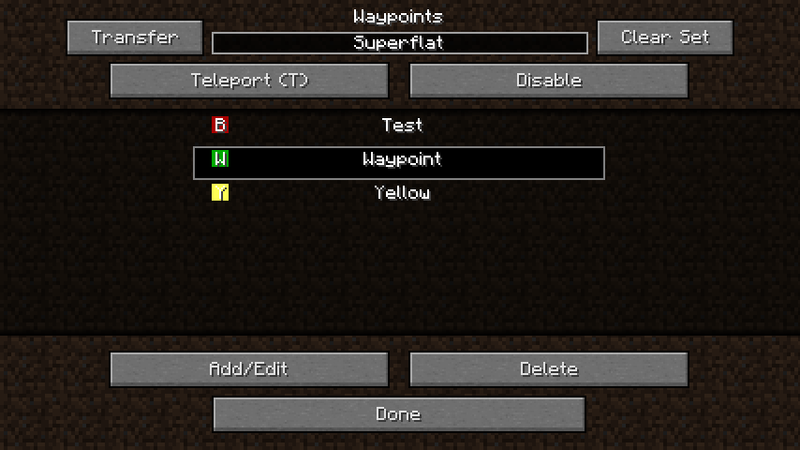 And we are begging you, xaero96, PLEEEEEEASE, add the deathpoints and waypoints in 1.7.10 version! I will eventually update 1.7.10 to the latest version, just not every update. Maybe every month (which makes it this week)? Also, I noticed, that map renders blocks from mods wrongly, for example BiomesOPlenty, or something like. It renders them correctly. The colours are based on the material, not the textures, just like vanilla maps.